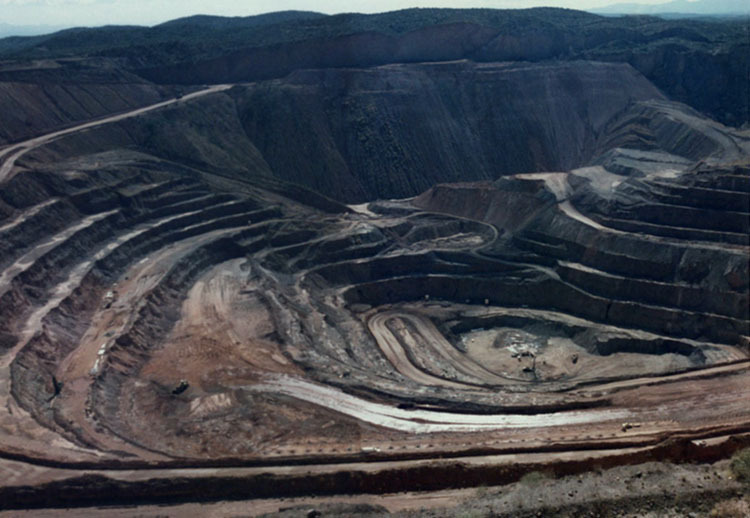 Open pit mines are used in coal mining as well as “hard rock” mining for metal ores, gold, copper, iron, aluminum, and a number of different minerals. A pit mine excavation is used in exposing ore in order to extract it. Ideally, large quantities of waste rock are moved at the lowest possible cost. The physical design of a mine is largely related to the ore and waste extraction required. Complex engineering decisions are made, making most mine pit designs an exercise in geology, economics, environmental protection and mining engineering. That said, some mine pit designs are just downright cool! Mine pit design is based upon a series of ledges or “benches.” Waste and minerals from the excavation are removed in successive layers, each creating a new bench and resulting in a visual “stair-step” effect down into the earth. During development and mining, several benches may be in operation simultaneously in different areas and at different elevations of the mine at any given time. If you’ve ever been to a large gorge or canyon such as the Grand Canyon in Arizona, Waimea Canyon on the Hawaiian island of Kauai, or Bryce Canyon in Utah, you know the beauty and grandeur of this type of formation. The shape and sweep of these concave wonders in the earth have a serene yet undeniably breathtaking effect. The photos are shot from an aerial perspective, and the result is an overall aesthetic that tricks the eye, making you wonder if you’re even looking at photography. The geometric and symmetrical shapes, sharp contrasts and rich hues make the images appear more like abstract paintings. Looking at these images, there’s a disorienting ambiguity that is at once strange and compelling. When the earth is impacted, it seems we cannot help but be touched by it; Maisel’s photography, naturally-formed canyons and large mine pit designs all conjure a sublime effect.